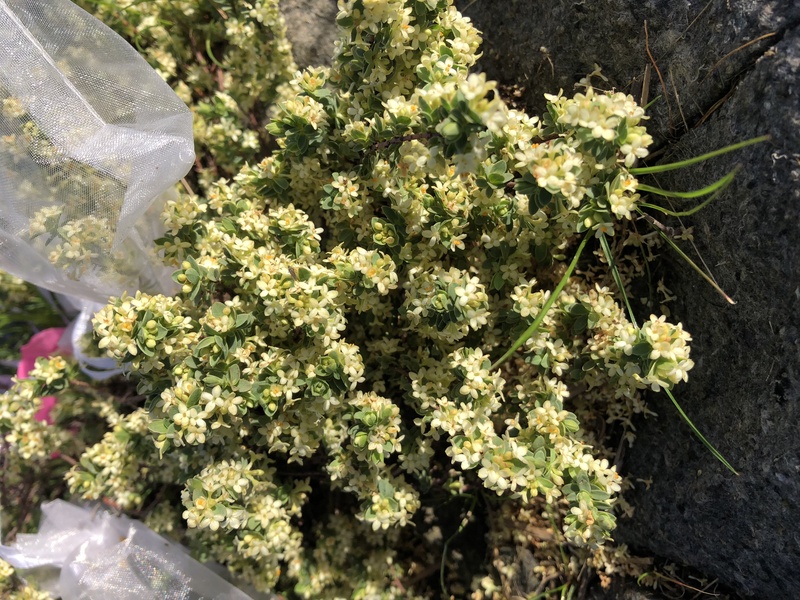 Aus Eco Solutions has just started collecting seeds from Spiny-rice flowers; in collaboration with the Spiny Rice-flower Recovery Team and with DELWP approval and permits. Pimelea spinescens subsp. spinescens (Spiny Rice-flower) is a small, long-lived perennial herb indigenous to the Victorian Volcanic Plains (VVP). Being critically endangered, the species needs all the help it can get, so at Aus Eco Solutions we are going to collect seeds, propagate them and then plant new species in protected grassland areas we manage in Melton and Deer Park. We are gathering Spiny Rice-flower seed from plants in a variety of areas, including Altona, Sunbury, Deer Park and Mount Mercer. Using plants from different areas helps promote genetic diversity within the often very isolated remnant populations. Propagation can be an intensive process, taking many months from start to finish. First, small bags are placed over female Spiny Rice-flowers and ripening seed. In a month or so, the seed will have fallen, and we will return to retrieve the bags. These seeds are notoriously hard to germinate, so we will need a lot of them! Often only one in a hundred will successfully grow into a new plant. But hopefully, by Autumn of next year we will have several new plants in the ground, helping to ensure the long term survival of this unique grassland species.